A Peacock Mantis Shrimp peers out from it's burrow, these animals are not shrimp and are quite intelligent with extraordinary vision that can see in 16 different colours as well as circularly polarised light. No one is really sure why their vision is apparently so advanced. Their claws are used for smashing prey and strike with the speed of a rifle bullet and even if they miss the shock wave may break open their prey's shell. They have been known to break aquarium glass. One of the best pics I have seen of this critter, with all that color, I am sure it would be a dynamite poster. Chris, amazing colors, markings and bodily structural components, an extraordinary creature and image. Thanks for sharing your interesting info, great to see it peering out of its burrow. Super image - what a gorgeous creature. Amazing photograph — wonderful color. 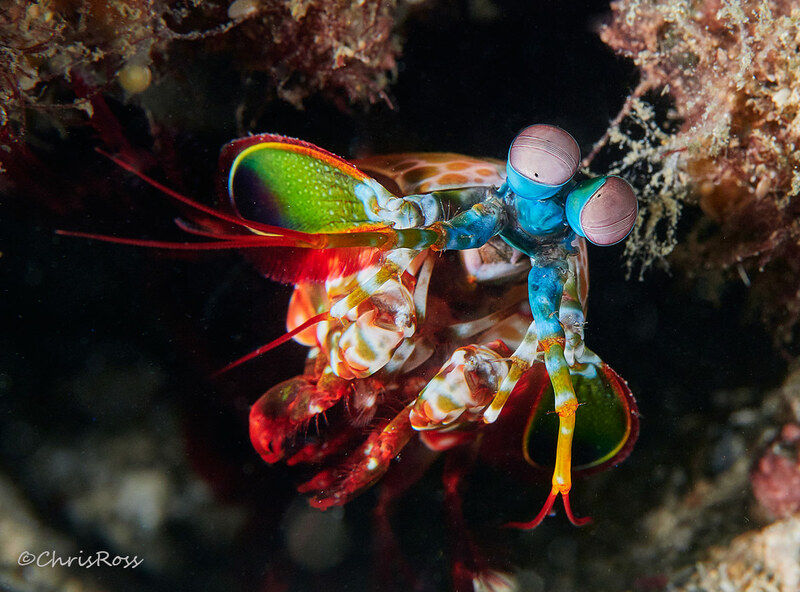 Amazing looking Shrimp, a beauty Chris. Superb capture of a beautiful creature! love the colors and details. WOW. One of the coolest underwater images I have ever seen - every color possible seems to be there, and your description is awesome. Nice one Chris. These guys put on a show. Very crisp and well lit. Brilliant capture of this crazy coloured hunter, Chris! Amazing shot.